It is such a quick and simple recipe, and I bet you have most of the ingredients already. This picture doesn't do it justice to show how creamy, cheesy awesome it was! 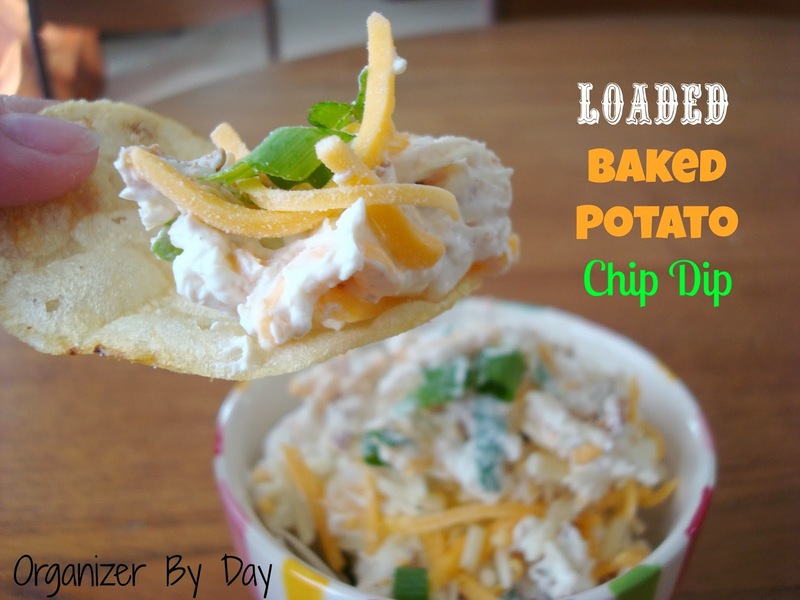 All the ingredients blended together perfectly and adding the potato chips made this taste like you were eating a loaded baked potato turned amazing chip dip. I promise this too will win your party guests over! This one was such a hit people were literally scrapping the bowl to get the last of it! It is a definite crowd-pleaser! Mix together the sour cream and cream cheese until well combined. Stir in the remaining ingredients and chill for about an hour until serving. 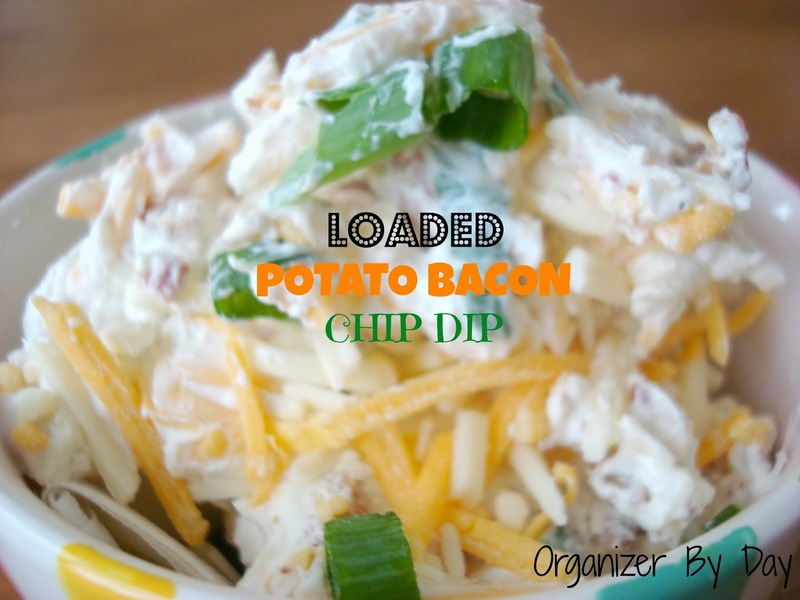 Serve with your favorite potato chips and enjoy! What are you serving at your up and coming football party? I'd love more ideas! Come back soon for another football fan favorite at party time! I just made something very similar to your recipe on my blog. I thought about using cream cheese like you did but decided against it. I will have to try that next time I make it. Love this dip! Oh. My. Word. I need to make this tonight! Thanks for sharing! Saved! This looks amazing. I love anything potato. Visiting from Miz Helen's. This is fantastic! Pinning! Seriously!!! This looks perfect for Super Bowl. So easy and you know everyone will like it because of the bacon.Thank you for joining us on our Four Seasons Blog Hop. Pinning Now. Linked up to your great party! Thanks for the invite! Looks amazing! I love anything with bacon in it!! Oh, this one is a keeper! Pinned it to my Appetizers & Snacks board. Oh my! This looks amazing! Pinning! 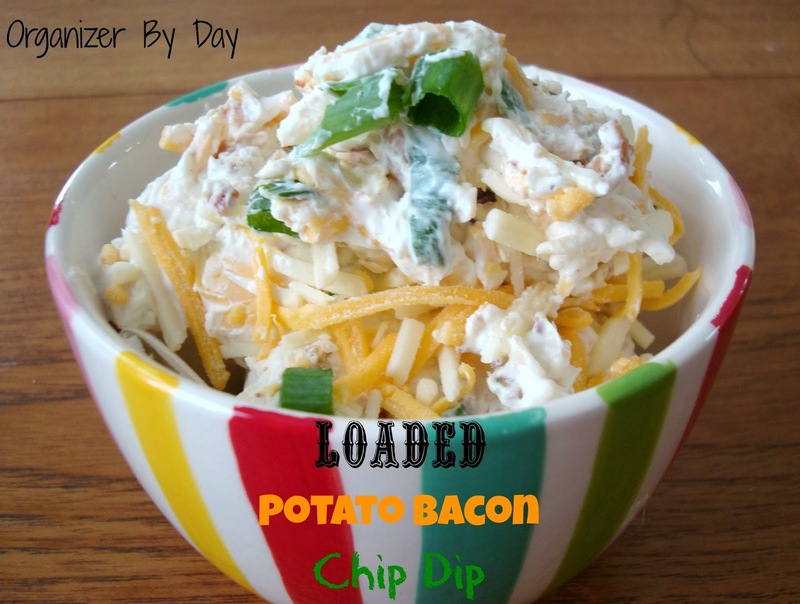 What a fantastic dip, we will just love your loaded Potato Bacon Dip. Thanks so much for sharing with Full Plate Thursday and hope you have a great weekend! Looks delicious! Thanks for the inspiration! I am on my way over! Thanks for the invite! All of my favorites in one dip! Must have for the Super Bowl! Thanks for linking up with What's Cookin' Wednesday! OK And this sounds amazing too!! I'm pinning this one to our talent board also.Thanks for sharing on DIY Sunday Showcase! Looks AMAZING!! Thanks for sharing at the Happiness Is Homemade Link Party! Awesome post! I have pinned it to the Happiness Is Homemade Party Board. I can't wait to see what you link up next week! Looks fantastic. So easy to prepare and love the bacon. I’m sure going to try this recipe. Thanks for sharing this with us at our Marvelous Monday Party! Pinning and hope to see you again next week! This would be perfect for the big game! This looks and sounds awesome. I'm definitely pinning this so I remember to try it. Yum. We are 5 different blogs so you get more exposure! See you there! Jenn!! You are so cute! I mean that sincerely. Linked up to the party and hung around your blog for a while. Congrats on the engagement! It will be such a happy time in your life. I liked and am following you in as many ways as possible :) Can't wait to see what you do next! My hubby won't be around for the superbowl this year...but you are making me want to watch just so I can make this! Thanks Allie! So glad you have your own link party! Adding your button and site to my party page and heading over to link up! Thanks for the invite! I'll be sure to stop by next week. this looks so good. I will have to make it very soon. Thanks for linking up at Tell Me About It Tuesday. We hope you hop over and share with us again next week. Hi Elie! I just wanted to let you know that I will be featuring your delicious dip on my blog later tonight! Thank you so much Gwen! I'll be sure to come by and check it out! Love your blog. This is just what I need!! I'll have to make this soon! It has all my favorite ingredients and I know it'll be a hit. Thanks for sharing with us over at the Homeacre Hop! Please join us again soon! Looks great, not helping my junk food cravings though! Featuring Friday at Bacon Time! You had me at Bacon! Thank you so much Mindie! I absolutely love your party and blog. Linked up and grabbed a button for my featured page. Hope you have a great weekend! Thanks for linking this up to the Thursday S.T.Y.L.E. Link Party! I loved your recipe so much that I chose to feature on this week's link party! I hope that you will stop by and link up again tonight at 6:00 MST. Thank you so much Katie! Linked up new fun stuff and grabbed a button for my featured page. I love your link party! Hope your weekend is wonderful! I just found what I am bringing to our Super Bowl party! Thanks for sharing at Share Your Stuff Tuesdays! Thanks so much for sharing this at Tell Me About It Tuesday! I hope you will hop over and check out your feature! Just stopping by again to let you know that I've featured your recipe as a host favourite in the Share Your Stuff Tuesdays link party. Thanks for sharing! Hope to see some more great posts again! Thanks Jenn! Made sure to grab a button and link up more fun! Hope you have a great week!